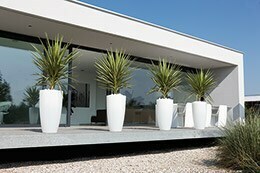 This is a great pot/plant combination, which would look great in most contemporary settings. The pot is made from 100% weatherproof resin and has a stylish white finish. It measures 53cm high and has a 30cm diameter, so will give the Cordyline australis, which is currently housed in a 2-litre pot plenty of room to grow on. It has an elevated bottom that can be filled with sand to provide a little extra stability - very useful when positioned in windy areas. The plant will retain its foliage throughout the year, so provided you have a relatively sheltered garden, can be left out throughout the year. In colder areas, it is advisable to move the pot (and plant) to a sheltered spot when the temperatures drop. Garden care: Please pierce the hole on the inside of the planter, to ensure any excess water can drain away freely. In areas that are prone to hard frosts, it's best overwintered in a cool greenhouse or unheated conservatory. In spring, when new growth appears and all danger of hard frosts has passed, cut back frost-damaged branches to just above the newly formed shoots.